Welcome! I am Rosalie Taylor and I have been working on my own genealogy for over 30 years. I started my journey many years ago when searching for your past meant hours of looking at microfilm and reading countless numbers of books on history of various states or cities. The search was definitely tedious to say the least. It was so exciting when we finally were able to have a thing called World Tree. This certainly made it easier. We would get discs sent to us with census, marriage and birth records for certain periods of time and you would insert the old “floppy disc” in the computer and search for hours. I’ve learned a lot by doing it the hard way. I hope that some of my blogs will help you with your journey to find all those Secrets From the Past. The Awesome Power of DNA! 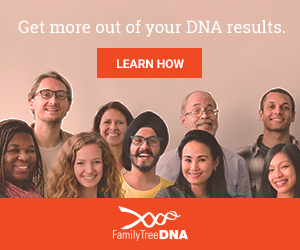 Shop now for great savings on Living DNA test, was $159, now only $119!